When I start planning our garden each year I always try to include a special fun garden idea for my preschoolers. We involve them in the garden every year, and it is always one of their favorite projects (and why not - they love playing in the dirt!). This year, in addition to planting, watering, and the eventual harvest, I thought we'd make some really fun DIY garden markers to help keep track of what we're growing. And since the boys are learning the alphabet and LOVE letters, I let a classic children's book inspire our project. 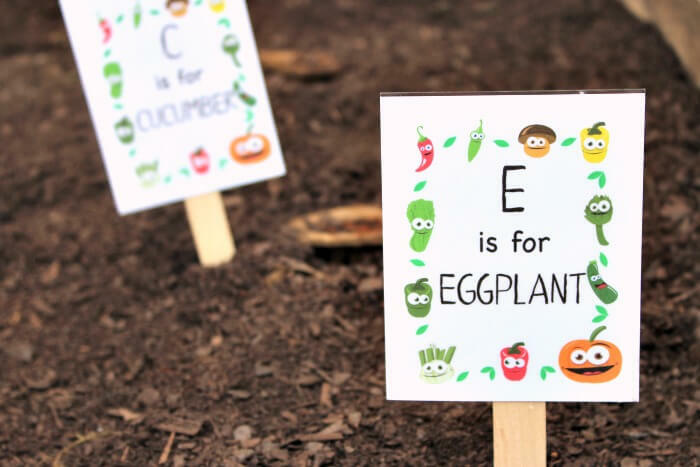 Our printable garden markers were inspired by Eating the Alphabet by Lois Ehlert. 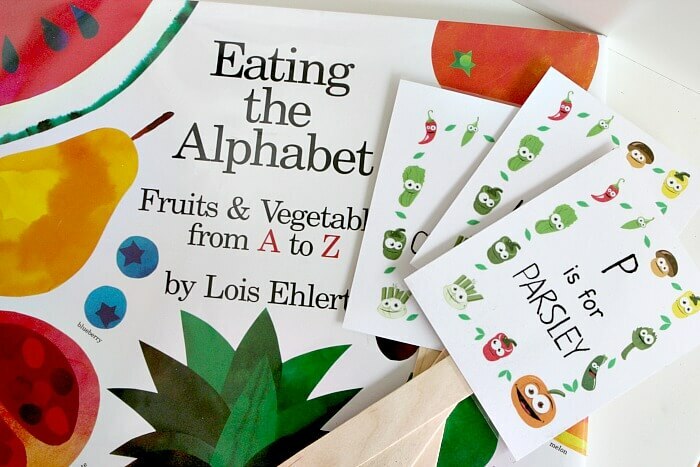 A really simple book that my boys love, Eating the Alphabet features the letters of the alphabet along with fruits and vegetables from A to Z, illustrated in the lovely collage art that Lois Ehlert is known for. I decided to make our garden markers highlight the first letter of each of our plants, so that we can practice our alphabet every time we go outside to check on our garden! These garden markers are super easy to make. I've included a set of 10 (based on what we're planting this year) along with 2 blank cards, so that you can make custom markers for anything that we've missed. Scroll down to download and print your own. I recommend printing on card stock. Once printed, they are really easy to turn into garden marker signs. First, laminate them to help protect them from the elements. If you don't have a laminator, I love to use these self stick laminating sheets (be sure to do both sides). Then cut out the cards. I use a guillotine cutter for easy straight lines. 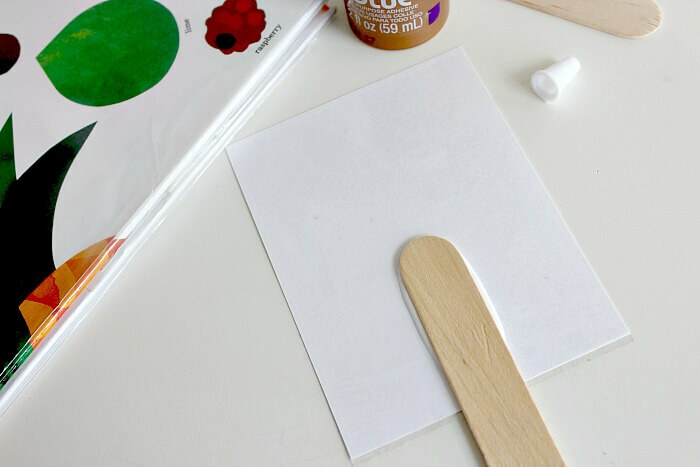 Finally, glue each card to a jumbo size craft stick, using either gorilla glue or a hot glue gun. Allow the glue to dry thoroughly before planting. That's it! Repeat as needed for as many plants as you'll have in your garden. Then simply stick them in your garden to label each plant. Now when you head out to water and check on your garden, your kids can help identify the plants and practice their alphabet too. 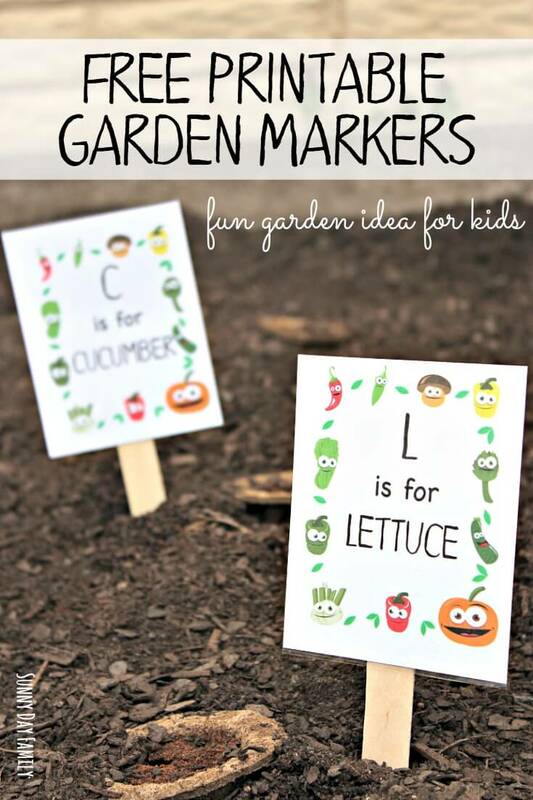 What a fun preschool garden activity! Get yours by clicking the button below. A fun way to encourage learning out in the garden. We bought carrot, radish, peas and rocket seeds yesterday to get us started once the weather warms up a little. These are so cute and the kids will get so interested in reading them!